Putting video onto your iPhone, iPod or iPad, sounds like it should be a simple task. However you can waste a lot of time trying to work out how to do it. This blog post will detail exactly how to do so, using a free software tool to make it super easy. The IOS software on iPhone, iPod or iPad can only play H.264 or MPEG-4 encoded video’s so you need to ensure that your video is in one of these formats before transferring it to your device. Your video file(s) should end with either of these file extensions; .mp4, .m4v or .mov (native Quicktime format). If the video you want to transfer to your device isn’t in either of these formats it won’t sync to the device from iTunes. 1. 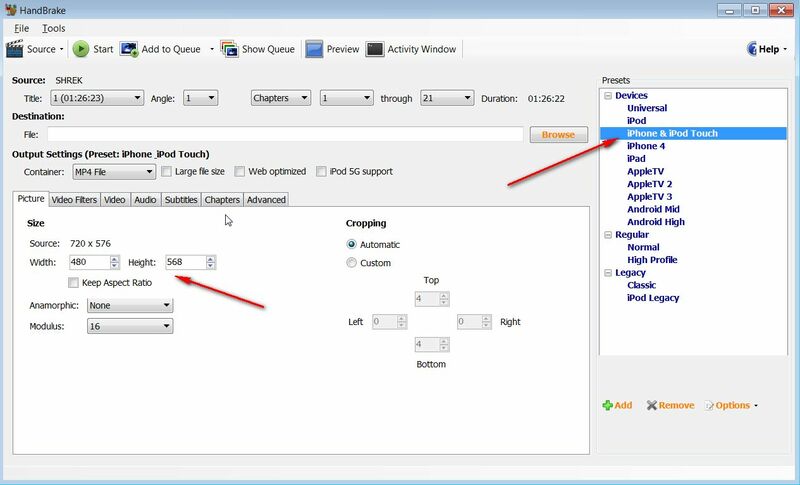 Converting your video into the right format is easy if you use a free special video conversion tool called Handbrake. Go and download and install the Handbrake software first. Note: If you are trying to copy a copy protected DVD you may not be able to use Handbrake without some more work. See this extra blog post on How to Decrypt DVDs with Handbrake. Choose your destination device. 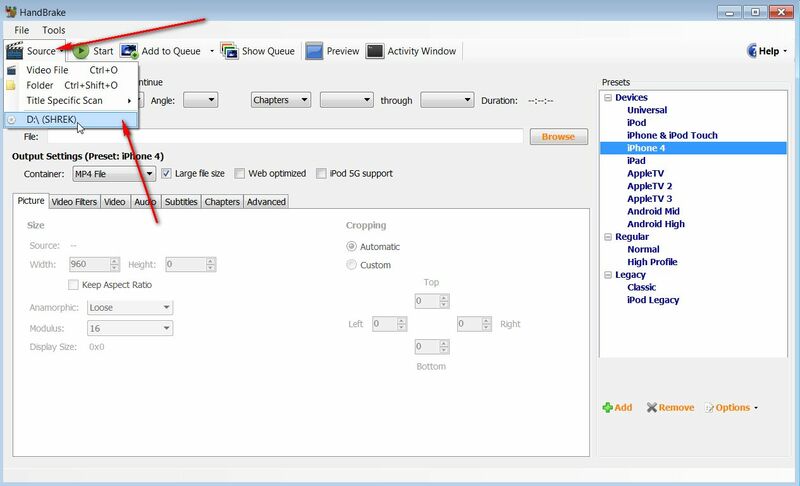 Handbrake has these video settings built into it, so it’s super easy, you don’t have to change any settings if you don’t want to. Select your destination file. Click the ‘Browse’ button. Call your file whatever you like with a .mp4 or .m4v extension, and choose a location on your hard-drive for it to go. Click on the ‘Start’ button at the top left of the window. Your video will encode into the correct size and format (depending on the size of the video and the power of your computer, you may be waiting a long time before this process is complete. 3. Now you can plug in your iPhone, iPod, iPad via USB cable and before you sync, just make sure to look at the Movies tab of your device within iTunes. You can if you don’t have Movies set to automatically sync then you can select the video you just inserted into the library. Now click ‘Sync’ and you converted video will appear in the Videos icon of your device. This entry was posted in How To's, iPad, iPhone, iPod and tagged iPad, iPhone, iPod, video. Bookmark the permalink.